Interested in becoming a Middlebury Natural Foods Co-op Vendor? Please read over the guidelines below, then contact e-mail the department that seems most relevant to your product. We’ll get back to you, soon! It’s nice to know where your produce is coming from. Local produce doesn’t have to endure the rigors of being handled many times, shipped long distances, and held at stores for days or weeks. Only varieties developed to withstand these hardships can be widely grown and shipped. Local growers aren’t restricted by these demands, so they can grow heirloom fruits and vegetables and diversify to get the most out of the short growing season in the Northeast. And small local growers don’t produce the genetically modiﬁed vegetables and fruits that commercial farms do—whose effects on our health are still unknown. When you buy food that was produced nearby, you’re supporting small family farms, preserving a time-honored way of life, and keeping farmland in production so it won’t grow up into forest or be developed. The barns and cultivated ﬁelds that characterize our rural landscape will remain. You can even visit the land where your food is grown and see it being harvested. 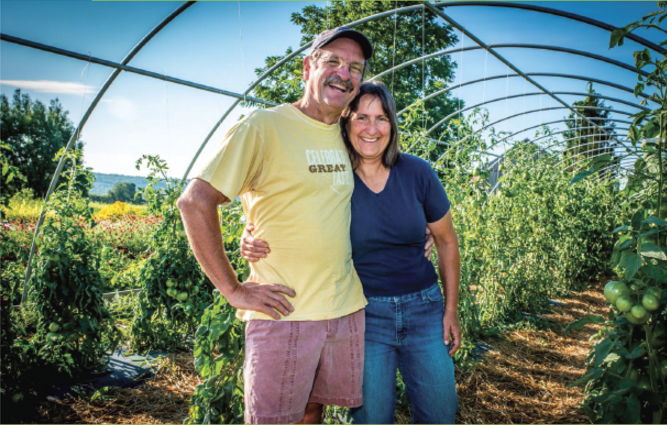 Over the past couple of decades, small-scale food production in Vermont has grown by leaps and bounds. Now there are numerous dairies making award-winning cheeses, organic farms that provide us with colorful, healthy vegetables, apiaries where we can ﬁnd healthy raw honey and honey products, small kitchens that turn out ethnic and traditional New England foods, and bakeries selling an amazing variety of artisan breads and pastries. Purchasing these foods not only sustains the people who produce them—in many cases your friends and neighbors—but also strengthens the economy of the region, diversiﬁes its lifestyles, and preserves the agrarian landscape that we treasure. We thank you for choosing to shop local and support local products! September is the month of our Eat Local Challenge and during that time we track how much your local purchases allow us to pay out to local farmers and producers. This number grows steadily every year and in September of 2015, your purchases of local foods allowed us to pay $346,804 to our local farmers and producers! WOW!